There is a program in a Bronx hospital that is emphasizing a "quiet" environment. 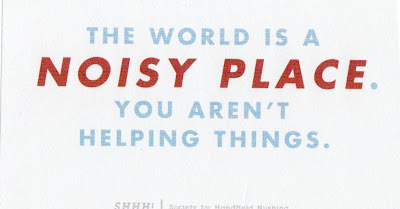 The program is called "Silent Hospitals Help Healing" or "SHHH". The hospital believes that maintaining quiet helps with the healing process. So, they have initiated a program which attempts to cut down on all the noise that occurs in a typical hospital. They repaired and WD40'd all the carts. Lowered the volume on monitors and call lights. The televisions were equipped with headphones. They installed noise reducing ceiling tiles and curtains. Employees were asked to wear soft soled shoes. Then they asked the unthinkable. They asked the employees to keep conversations in the hallway to a minimum. Minimal talking in the hallways?? That's where I get all the gossip, er...I mean information to perform my job duties to the best of my ability. I'm going to need help if they ever start this program where I work. Where do you find this stuff? I basically don't need to watch the news, I just go on to you blog for all my info. Can you imagine if we had to be quiet at work? There's no point of me showing up - gossiping... oh excuse me, gathering info is what makes my job so much fun!! I do however, think we have too much fun sometimes and can kinda get a little obnoxious. OH WELL!! Glad to provide you with all your information needs!